Six inches long. Dark blue, almost black head, back, wings, and slightly forked tail. Cream-white forehead and ring neck. Gray breast, white underside, light chestnut rump. Richer, more reddish brown throat than that of the Barn Swallow. 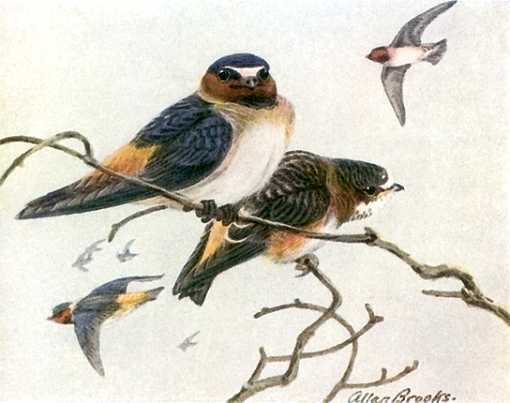 The American cliff swallow is found throughout most of North America from Alaska to the southern edges of Hudson Bay, southern Quebec and Newfoundland, throughout the States excluding the Southeast from the Carolinas to southern Louisiana and winters in the tropics as far as Brazil, Paraguay and Argentina. 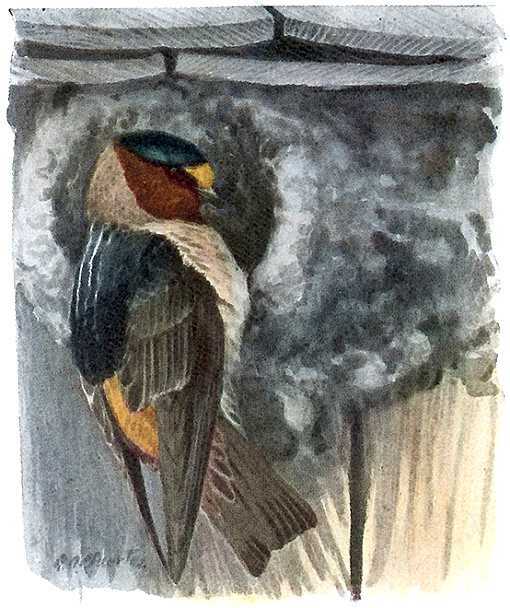 More cliff swallow species in the genus Petrochelidon inhabit regions in Africa. They catch flying insects in graceful aerobatics usually over water and skim insects off the surface of ponds. Sometimes they eat fruit. Dive at intruders near their nests, snap their beak and pull up before colliding. Build gourd shaped enclosures with small entrance holes out of mud pellets reinforced with straw and lined with grass, straw and feathers. Colonies of sometimes fifty or several hundred mud nests adhere to shear vertical cliff faces, walls or beam sides, under bridges often above water, under wharves or under building eaves. Females lay about three to six spotted white eggs, which hatch after about two weeks incubation and young leave the nest in about another three weeks. They gather in large flocks before their incredibly long fall migration. Flocks return to the same colonies year after year, are absent for a few years while they occupy colonies at other locations, then return for a few more years. 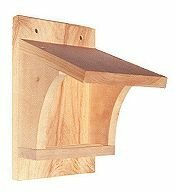 Barn and cliff swallows don’t need assistance beyond the human made structures they normally exploit, but they have been attracted to areas within their range by adding some type of overhead mantel to existing structures which did not previously provide shelter. Obviously, if shelter is available, there is no need for these designs. Unless, for example, you don’t want them nesting under your porch and the mess they can make, you can draw them away to an alternative. Even if it’s a long shot, it’s very little effort and they are nice looking ornaments. One shelter has a 2″ by 8″ ledge, approximately a 8″ high gable roof, an open front and partially open sides. Another has a 2″ by 6″ ledge, approximately a 6″ ceiling, an open front and partially open sides. If there are no open barns, sheds or eaves, mount a shelter high on the side of a barn, shed or garage. Do not mount in a tree. Make sure objects that cats and squirrels can climb do not provide access to the nest. Cats can leap 8′ horizontally! The purpose is to simulate a cliff face. 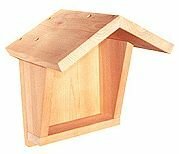 One shelter has a 2″ by 8″ ledge, approximately a 8″ high gable roof, an open front and partially open sides. Another has a 2″ by 6″ ledge, approximately a 6″ ceiling, an open front and partially open sides.